Nasir, a member of the Electical Engineers Community sent us a 11 parts tutorial on transformers. Today here’s the 9th part focused on Auto transformers. As for the previous parts, you can find them in the blog and on the forum. 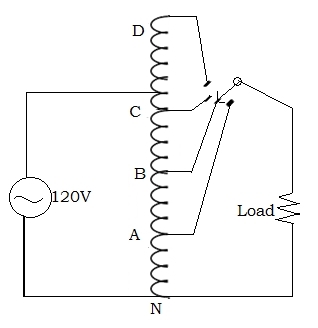 An auto transformer is the one which consists of a single winding, part of which acts as the primary winding of the transformer, and some part of which acts the secondary winding, which can be varied by switching between the contacts of the transformer. By varying the contact of the switch we can change the number of turns which are accommodated in the secondary winding. Since the output voltage depends upon the number of turns of the secondary winding, so in this way the voltage output can also be varied. For this reason, an auto transformer is also known as a “Variac” because it is mostly used to vary (step up or step down ) the output voltage which has to be supplied to the circuit. In general transformers, there are two windings which are magnetically linked to each other, but re physically separated from each other. But in an auto transformer, both the primary and secondary windings are connected to each other, both physically and magnetically.